Q: What are expandable soils? A: The term expandable soils refers to a group of soils that can change volume when provided exposure to water. The two most common types are Clays and Silts. I say “clays” and “silts” in the plural because there are actually a number of differing clay molecules as well as silt types. All have specific individual properties, but share an affinity for water and will draw it to the soil whenever possible. They also share a common characteristic of being very small in size. Clay and silt particles can pass through an opening 1/200th of an inch in size. This leads to a common term of “minus 200” soil when discussing the topic. Minus 200-size particles are similar to talc or flour in consistency. Q: There are lots of terms out there: expanding soils, expansive soils, expandable soils, shrink-swell soils, swelling soils, and more. Are these all the same, or different, and which is the proper term? “Expandable soils” is the proper term. “Expanding soils” is an improper term in that it conveys the certainty of expansion, rather than just the potential. “Shrink-swell soils” merely describes how the same soil that expands when wet will often shrink or reduce in volume when it dries. So for all practical purposes, it’s best to refer to them as “expandable” soils. Q: Are expandable soils unique to Colorado, or are they found in other states or regions? A: Many locations around the country have expandable clay soils. This has led to regional terms for clays such as Bentonite, Georgia Clay, Caliche, and Gumbo, among others. All are unique, but share certain characteristics as far as how they behavior during the construction of homes, septic systems, and retaining structures. The geology of a region, as well as the manner in which soils were deposited over time, can change the specific soil characteristics. For example, what makes central and eastern Colorado different from other areas is our close proximity of the Front Range, and the transition from plains to mountains. Soils are modified over time by many things: the erosion off the mountains, the creeks running along the base of the mountains, and the seasonal moisture fluctuations (i.e. spring runoff). As a result of these factors, we have many different types of soils, often in a geographically confined space. Q: In Colorado Springs, are there some parts of town that are worse than others? A: Depending upon your location, soils can be expected to change volume when the moisture content of the soil changes. However, if the site is in an area with little or no clay sized particles (such as Briargate), soil movement is unlikely. In areas with more clay (such as parts of Rockrimmon and Fountain), movement is much more likely. Yes, some parts of the region are notorious for having problematic soils, while others have little or no expandable soils. You can get a feel for the problem areas a few different ways: by asking your builder or your builder’s soils engineer, by checking geological maps of the region, or by having a soil test performed on a specific site. One potential red flag to look for when building is when you find one single lot that hasn’t been built on in the midst of a completed subdivision; this can be a problem property. Also, be cautious if the selling price is seemingly too low with no explanation—it might be due to known soils problems. Q: If I’m having a new home built, can I know if the land I’m building on has expandable soils before digging starts? A: Yes, but with limited certainty. It is crucial to either review a soils test from a licensed engineer for the property in question, or have a drilled soil test performed prior to closing on the purchase of the property. Make your offer to purchase the land conditional on the state of the soils, since having expandable soils (or otherwise poor quality soils) can significantly increase the construction cost for building on your lot. As a matter of standard practice and code requirements, an “open hole” inspection is conducted by the soils engineer after excavation. It is this open hole inspection that will reveal the suitability of the existing soils to support the foundation system as designed. When expandable soils, or the presence of groundwater for that matter—another blog post altogether—are encountered, remember: don’t shoot the messenger! A good builder should prepare you for the possibility of expandable soils and the possible need for mitigative measures (such as the need for an “overdig”—more on that below) but he will be learning of the full extent right along with you, the property owner. Be prepared for what could amount to considerable costs associated with these measures. Q: What if we’re excavating on my land and we find expandable soils? What can be done about it? A: Once it becomes known that expandable soils are present within the footprint of the home, (either by drill test, or upon the actual excavation, or both), there are engineered prescriptions that address both removing and mitigating its presence and effects. The most common prescription in this case is what is called in the industry “an overdig”. An overdig is, just like it sounds, an over-excavation beyond what would normally be required to place the footers on virgin ground. The depth of an overdig is typically 4 feet or the depth required to remove all of the expandable soil, whichever is less. This overdig will also extend laterally to the same extent as the depth. Once the overdig is complete, suitable soil is imported from somewhere else and compacted as needed. This is just a typical overdig scenario though, so keep in mind that each case is different and will require a Soils Engineer’s inspection, prescription and monitoring at prescribed intervals on the overdig and import/compaction of good soil. All of these can be tricky to estimate going into the procedure, so your builder will do his best, but you may not know exactly what it will cost until the work is completed. In limited cases, there may be other things you can do instead of an overdig. Some of these include: the use of caissons, helical piers, or post-tensioned slab floors. All of these methods are generally employed when an over-dig is not sufficient at effectively mitigating the expandable soils presence, and further costs increases should be expected. Q: What if my home has already been built? Are there steps that I can take to prevent soil expansion? A: Generally, anything you can do that will limit or eliminate the amount of water retained by soils near your foundation is a good choice. Slope the ground surface downward and away from the foundation for at least 10-15 feet from the home. Extend downspout discharges the same distance (10-15 feet). Don’t use solid plastic ground cover—it will trap moisture below the plastic. Place irrigation such that all water flows away from the foundation. Be careful with the use of drip irrigation, as it can give a false sense that the amount of water dripped is minimal, which may or may not be the case. With drip systems, you often have a poor idea of how much water is flowing per day. If you can, pave your landscape with permeable materials such as independent paving blocks that drain away from the foundation as well. The bottom line is, simply: try to prevent water from getting near the home’s perimeter in the first place so that expandable soils never have the impetus to expand. Q: If the soil under my home expands, what kind of damage will it cause, and can it be fixed? Concrete floor slabs will often “heave” (e.g. rise with upward movement), which can result in cracked drywall and ceilings, as well as misaligned doors and windows. Soil movement can also cause foundation damage, such as heaving (upward movement) or settling (downward movement). 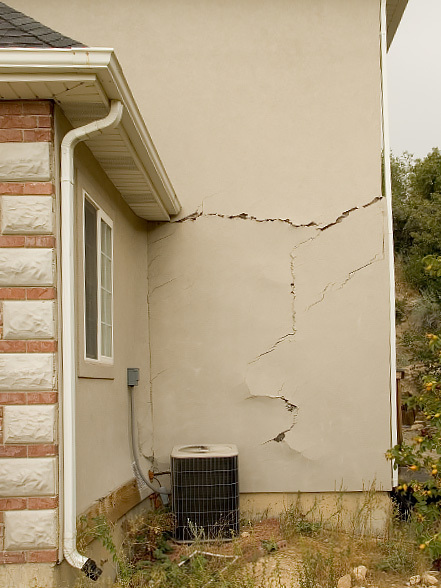 If your foundation is damaged, it can be repaired, but it may take some major work to fix it. 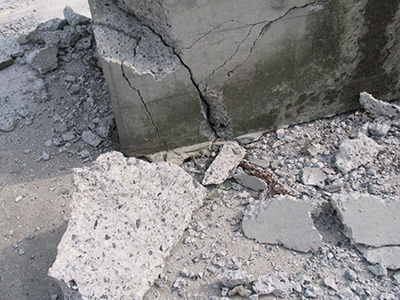 This often includes helical repair piers or replacement/reinforcement of the existing foundation. (Note: this kind of work should be designed by a licensed Professional Engineer, not just a foundation repair craftsman or engineering technician). For the most part, we don’t see a lot of damage due to expandable soils. It is not uncommon, however, even after mitigative steps have been taken, for non-structural concrete slabs to experience modest movement over time. Generally, proper construction detailing of the structure of any style house, along with maintenance of proper grading, drainage, and landscaping will minimize the chance of soil movement on any site. Ultimately, the main thing is you just want to make sure that your builder is taking the proper steps to mitigate against soil expansion when building your home, and after you’ve moved in, make sure you try to keep water away from the foundation as much as possible. If you have any questions about building methods in Colorado, or have found that you need to mitigate for expandable soil while building on your property, feel free to comment below or contact Stauffer & Sons Construction here. Good luck building! Chuck Milligan, Ph.D., is a licensed Engineer and the founder of Geoquest, LLC. Geoquest is a soils engineering firm based in Colorado Springs, Colorado. Chuck has a Doctorate in Construction Management and a Masters Degree in Geotechnical Engineering (both from Texas A&M University), and was previously a professor of Civil Engineering at the US Air Force Academy. Contact Chuck for your soils engineering needs by calling (719) 491-0556. A thought regarding garage floor slabs in expandable soil areas: would installing airways similar to radon mitigation systems provide a path for water under such slabs to escape? I am particularly thinking of snow dripping from autos as a source of moisture added within the confines of the footings. Under expandable soil areas slabs often heave within a few years after construction. Perhaps an escape route through under-slab piping w/ or w/o a fan could reduce this phenomena. Hi Terry, good question, although I think it contains some inaccurate assumptions. For example, if you do indeed have expandable soil, we would remove this material during the over-dig so there wouldn’t be any under the garage slab… that’s the whole purpose of an over-dig. Also, the small amount of moisture left by snow melting wouldn’t be able to actually penetrate the slab. We also use perimeter drains and interior drains (“French drains”) as well, which prevent these kinds of issues. That’s a good topic for a future blog post, actually. 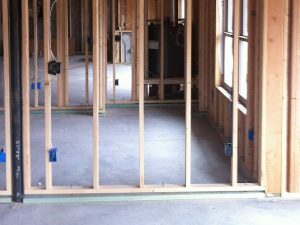 If we were to build a slab to truss partition wall in a garage in Colorado Springs, say for a mudroom, do we float the walls just as we do in a basement? I believe I read that nothing should go in the expansion space, so how would one insulate this space? I don’t enjoy putting on cold shoes on a 0 degree day. I’d like to have a small baseboard heater in there but worry about energy/heat loss via the expansion gap. Hi Todd, any non-structural slabs need to be isolated from structural components/members. You can fill the void of the wall float with insulation – that doesn’t negate the isolation. I hope that helps. We are looking to build a 60 by 80 indoor arena on our property in Black Forest (south of the tree line). Should we do a soils test on the site before we purchase the building? Hi Andrew, I’m not sure exactly what you mean about the foundation, but yes, we can definitely build a garage with an apartment on top. I ope that helps. I meant, homes in Colorado don’t usually have slab foundations, I think due to cold, but garages are slab. From your answer it seems slab is ok, but perhaps not the best for a dwelling? Andrew, I think I understand… in Colorado, homes are built with concrete footers and then concrete pads are poured on the ground after that. The same goes for a garage: we still add footers and then pour concrete for the car to park on. So the method for how it’s done won’t affect whether you can live in it or not. I hope that helps.